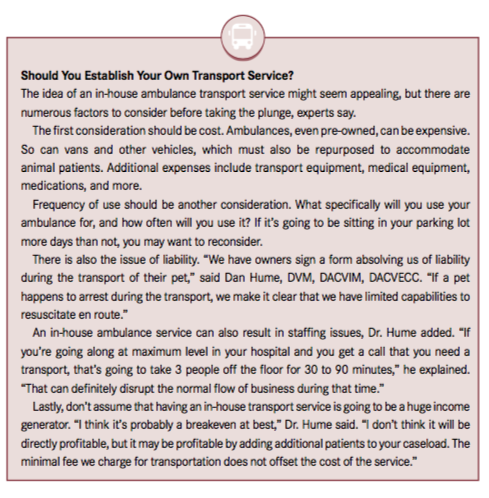 Whether for emergencies or pet transport, being affiliated with a veterinary ambulance service can be a boon to your business. The traveling circus called in a panic. One of its camels had lacerated a back leg while exiting its trailer and was bleeding profusely. No veterinarian was available—could Animal Ambulance of Southern California lend a hand? The Garden Grove–based veterinary ambulance service immediately dispatched a licensed veterinary technician to the scene, where the camel was restrained and its wound was cleaned, sutured, and bandaged. The next day, a veterinarian from the Los Angeles Zoo examined the camel and declared the repair sufficient. Sewing up an injured camel is unusual, but this story illustrates the eclectic nature of the cases that veterinary ambulance services may encounter on any given day. More commonly, they transport ailing pets from their owners’ homes to the veterinarian or from a primary care practice to an emergency clinic. Some also help with in-home pet euthanasia, work with first responders to treat animals affected by fires and other disasters, and assist police and other agencies in cases of animal mistreatment. AmbuVet Pet Ambulance, one of the largest pet transport services in New York City, is a good example of a multiservice company. Based in Jackson Heights, the company was founded in the aftermath of the terrorist attacks on September 11, 2001, said owner Don Montes. As rescue dogs started to arrive in New York City from around the country, Montes, a licensed veterinary technician, decided to help by collecting food and supplies from area veterinary clinics and delivering them to the disaster site. He and colleagues then stayed to assist until the Federal Emergency Management Agency arrived with its own veterinarians and technicians. “After that, I felt something needed to be done because at that time there were no ambulance services for animals,” Montes recalled. “As a licensed technician, I felt it was my responsibility to at least try.” Additional veterinary ambulance services have popped up in New York and other cities in recent years, but overall growth has been relatively limited nationwide. The majority of current businesses serve larger metropolitan areas, although some also cover rural regions. Local and state laws regulate what services they can and cannot provide. Some companies, such as AmbuVet and Animal Ambulance of Southern California, employ licensed veterinary technicians, which enables them to provide in-transit medical support such as pulse oximetry, ventilation, intravenous administration of medications or fluids, and suction. 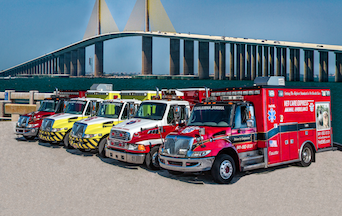 Others, such as Vet Care Express Animal Ambulance in Bradenton, Florida, and Pet EMT Animal Ambulance and Transport Service in Raleigh, North Carolina, do not employ licensed technicians and provide basic transport only. Most transport cases are relatively mundane, but sometimes crews nd themselves dealing with truly tragic situations. Montes recalled responding to the filming of a reality show during which 2 dogs, apparently distracted by the film crew and equipment, leaped from the roof of a building. One dog was impaled on a tree, but the other landed on a wooden table, which helped to break its fall. Although severely injured, that dog survived, Montes reported. On a lighter note, AmbuVet also assisted in reconnecting pets with their owners in the aftermath of Hurricane Sandy, a job that brought Montes great joy.